The workforce is changing, and that has many people making sweeping generalizations about trends. PNC’s director of talent explains why it’s important to take a step back. Over the past three decades, experts have had much to say about the changing workforce and the future of work. While trending topics vary over time, one thing is clear: talent– having the right people in the right roles at the right companies – is more important than ever. Even though most people can agree on that, you still hear about misleading “trends” that seem to predict doom and gloom for job seekers, employers and employees alike. However, Cat McLaughlin, director of talent and total rewards at PNC, says many “trends” are specific to certain industries or even outright myths. McLaughlin sets the record straight on five common themes about the workforce. 1. Myth: Millennials change jobs more than any other generation. 2. Myth: Massive numbers of retirees are going to disrupt the workforce. Some regions and industries are facing more retirements than new employees, but certainly not all. Rust Belt cities like Pittsburgh and Cleveland generally predict more aging workers in the future, and are taking steps to attract younger workers who can help balance the population and prevent a widespread worker shortage before it happens, McLaughlin says. 3. Myth: Automation will lead to massive layoffs. The future of work involves automating systems, and it’s already begun. “For many companies, this isn't having a huge impact on the size and scope of their workforce. In the short term, most companies won’t see automation drastically reduce the number of jobs,” McLaughlin says. 4. Myth: There’s no such thing as an entry-level role anymore. Most young job seekers will tell you how hard it can be to find a job with little experience, but that’s beginning to change. Many companies are catching on to the importance of internships for college students. Not only do internships give students the opportunity to learn job-specific skills, but they also allow companies to review their performance and consider them for future jobs. On top of that, companies are finding they need to fill more and more entry-level roles. Some are creating training programs to help people develop the skills they need to fill those roles. 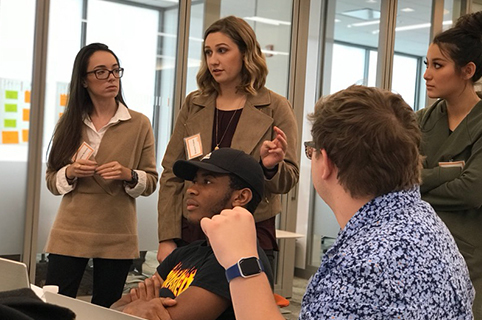 PNC worked with other large companies to develop PartnerUp, a program that helps high school students learn about entry-level roles that have opportunities for growth and development. “We want young people to understand that there are great career opportunities at these employers. They just need to know where to look, so we’re helping with that” McLaughlin says.